Fax Connect frees you from the costs and complexity of old-fashioned fax lines. Securely send and receive faxes over the internet, using your existing number. Use your familiar fax machine, your email, or the Fax Connect web portal. At your desk or on the go, you have the freedom to fax anywhere, anytime. Modernise how you fax. 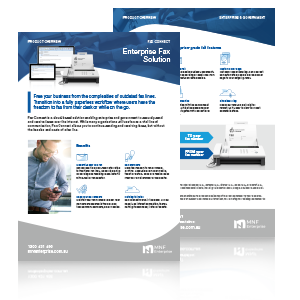 Fax Connect is a simple, scalable and NBN-ready alternative. Keep your fax number and get rid of old-fashioned fax lines. Stick with what you know. The optional Fax Connect adaptor lets you send and receive through your existing fax machine. Maintain your fax numbers forever. Your numbers are secured in the cloud so they can work anywhere, on any device. Automatically add a branded cover page to your outgoing faxes. It's easy to make the right impression every time you send a fax. Fax Connect works in the cloud. All you need in an internet connection, there's nothing to download or install and no expensive updates. The Fax Connect web portal keeps recent faxes on file in the cloud. So you can view and download your past communications. Send and recieve faxes on the go, via your email or the Fax Connect web portal. Fax from your mobile, tablet, desktop or laptop. Securely send and receive faxes over the internet. Keep your faxes on file in digital format.